No.40, Vittal Mallya Road, Bangalore - 560001, Karnataka, India. 42 Estates has been building path-breaking edifices and reshaping spaces. Ease of usability , style , and luxury are the cornerstones of our work. For us , our clients’ comfort is paramount. 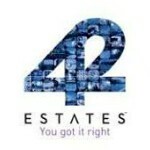 42 Estates has made its mark across the world , with business footprints in The United States , Dubai , and India. Our constructions make a unique contribution to the skyline. With engineering marvels , design innovations , and architectural aesthetics we have carved a niche in the residential and hospitality sector. While 42 Estates brings a continental flavour to designs, we make sure we conform to the local norms, conditions, and the market forces. This makes us a truly unique and innovative construction firm with a global perspective. 42 Estates is an organization which has grown owing to its emphasis on customer experience, which is the key factor behind all our efforts and decisions. The business processes at 42 Estates are designed by stalwarts from the industry keeping in mind the end-user. Customer centricity is the primary driving force behind all our efforts, our designs and constructions are a reflection of it.